Brad Shafran stood near the baseline and watched his opponents’ volley sail a bit higher than expected. Like he usually does, Shafran charged forward, set his feet, and fired a forehand winner down the center of the court. Brad Shafran and his sister with Alison Riske. It seemed just like a regular point for Shafran, an avid player and former college standout. The only difference? His doubles partner during the match, Alison Riske, is one of the world’s best players. The 2013 Condor Capital Charity Open provided plenty of these moments Tuesday afternoon at Courtside Racquet Club in New Jersey. 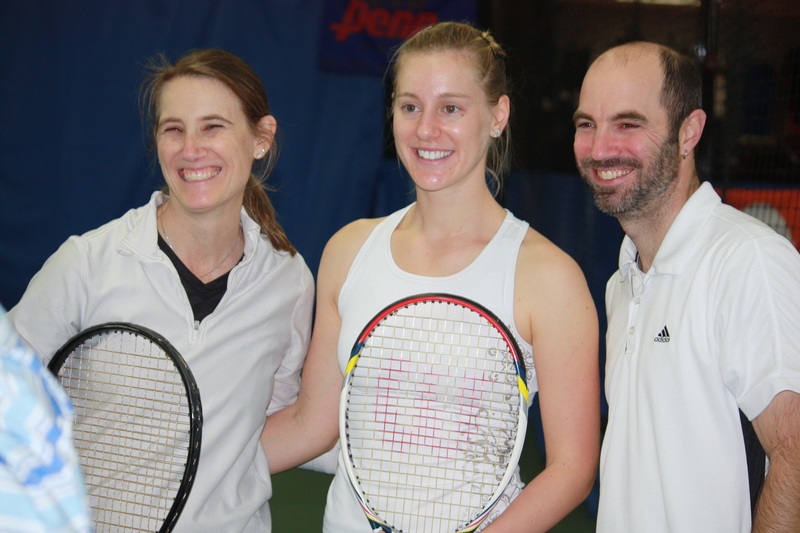 Current and former pros like Christina McHale, Luke Jensen, Katrina Adams and Jimmy Arias joined Riske to put on a clinic, pro-am and a 2013 version of the historic Battle of the Sexes match. Individuals who signed up had a chance to participate in the adult or kids clinic, which was followed by a group pro-am that matched players with and against the pros in a doubles format. The pro-am finals, with Arias and McHale on opposite teams, took place in front of a packed house leading up to the evening’s main event. Instead of watching Billie Jean King take on Bobby Riggs, fans at Tuesday’s event saw Riske – one of the top American women on the pro tour – face off with Jensen, a former major champion in doubles who is currently the head coach at Syracuse University. New Jersey native Joe Piscopo, made famous by his skits on Saturday Night Live, was in attendance to provide commentary. 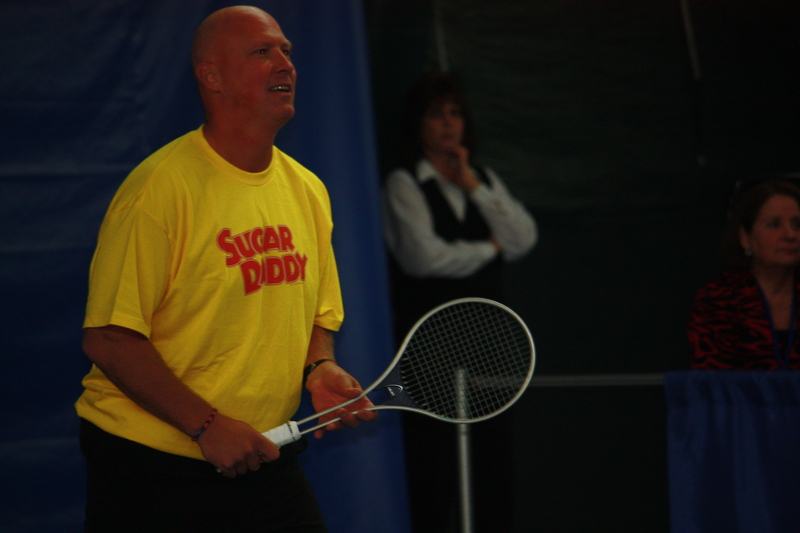 Jensen wore a bright yellow shirt that donned the same “Sugar Daddy” text made famous by Riggs 40 years ago, showing off his explosive ambidextrous serve throughout the match that yielded ace after ace. But just as King did back then, Riske battled through and pulled out the win. The fan favorite throughout the night, Riske used her speed, setting up winners with aggressive and accurate placement at each corner of the court. 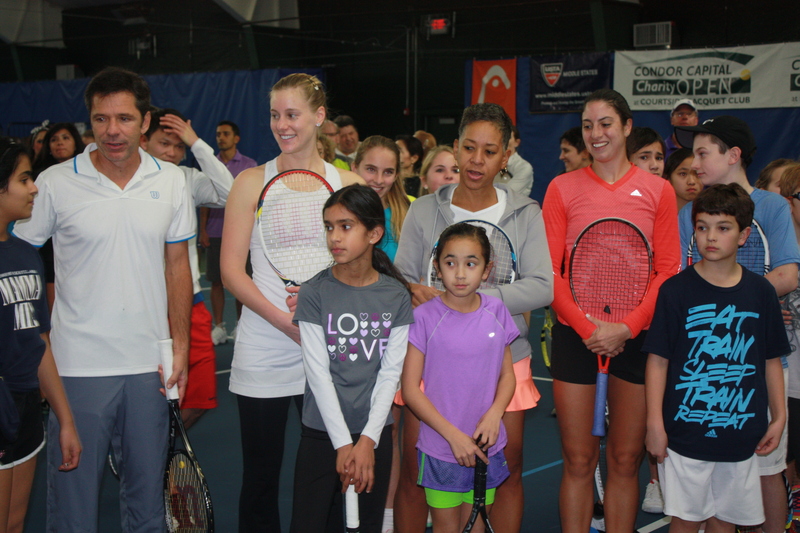 Alison Riske, Katrina Adams and Christina McHale with fans during the clinic. “I couldn’t keep up,” Jenson smiled. It was a fun, friendly and laid back atmosphere all night, with proceeds benefiting various charities, including The Children’s Development Center at Hunterdon Medical Center. Courtside has hosted pro events in the past, as well. Two years ago, the Bryan Brothers and Justin Gimelstob made an appearance at the club in the same event. To see a photo gallery from the event, click here. For more information about Courtside, or to get involved with the club, click here. JTCC’s Alison Riske participated in the 2013 Condor Capital Charity Open and battled Luke Jensen in a re-make of the Billie Jean King v. Bobby Riggs Battle of the Sexes match.